Ben was given some good advice from one of my siblings before we got married: All Flakes need their sleep. He has been really good about this, especially since he is still on "farmer standard time" and consistently gets up at 6AM everyday. However, the last couple of days he has had trouble sleeping. He woke up at about 4AM this morning and rolls over next to me and says, "Hey Ash I love you." To which I reply "Mhmm." This means "I love you too, but I'm sleeping." This is routinely at 6AM, but the insomnia caused it to happen at 4AM this morning. Then at 5AM, Ben rolls over and says, "Hey Ash, I love you." "I'm gonna go to the gym." At 6AM, Ben comes home. "Hey Ash, I'm gonna make breakfast. You want eggs? Pancakes?" "But we don't have any syrup. I'll go get some." At 7AM, "Hey Ash I love you." "I made you breakfast and I got you a surprise!" So I sit down at for breakfast and Ben brings out my surprise. 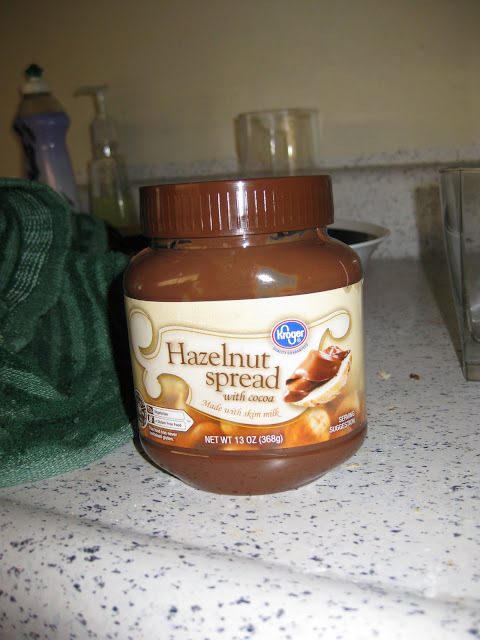 It was a jar of "hazelnut spread," or for those of you hazelnut-savvy, this is the ghetto version of Nutella. This is a favorite of mine, as I'm sure it would be of any Flake knew about it. It's basically chocolate you can put on bread, bagels, or pancakes, and it's not considered dessert, but actually lunch or breakfast. So basically you can fulfill your chocolate craving in an "acceptable" way instead of stuffing Ho Ho's or Hershey's Kisses down your throat. Awesome. I think I'm going to go make myself a "snack" at work. Thank you Ben :). "We're in the Army now." 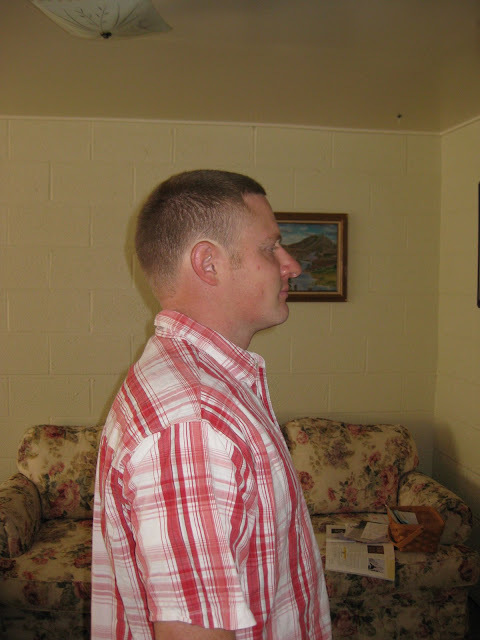 Also, at this point I was glad I married a dude and not a girl, because I said so many mean things about his haircut, but instead of crying like a girl he thought I was saying some really funny jokes. "Will they give you your money back?" "They could've donated your hair to Locks of Love." Ben: "It's okay, this is just the Lord preparing you for when I go bald. Do you still love me with less hair?" Ashley: Long pause...thinking, thinking..."Yes." Ben: "What do you think about my haircut, is it growing on you?" Ashley: "No, but I wish more was growing on YOU." -Sealing rooms on the top floor. 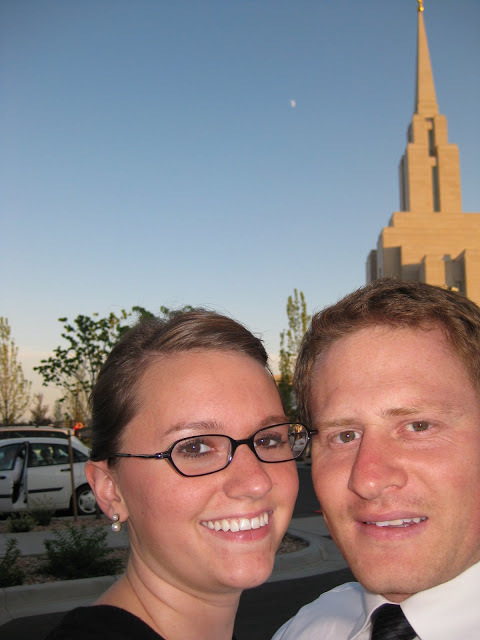 I told Ben a long time ago this is how I thought the Provo Temple should be, because the sealing ordinance is the closest you can come to God. Glad to see me and the Prophet (or probably just the architect of the temple) are on the same brain wave. As many of you are aware, I didn't have the best birthday. I didn't even get a cake. So Ben made up for it the other day by making me the molten lava cake mix we had bought for my birthday. 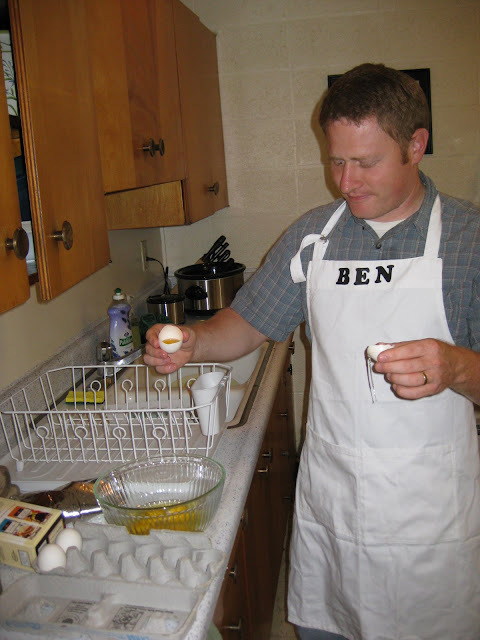 Many of you are also aware that Ben doesn't really know how to cook. However, they actually turned out pretty well, and Ben says that he can make them "perfect" next time. Apron courtesy of Mom Flake. Thank heaven Ben got a haircut! 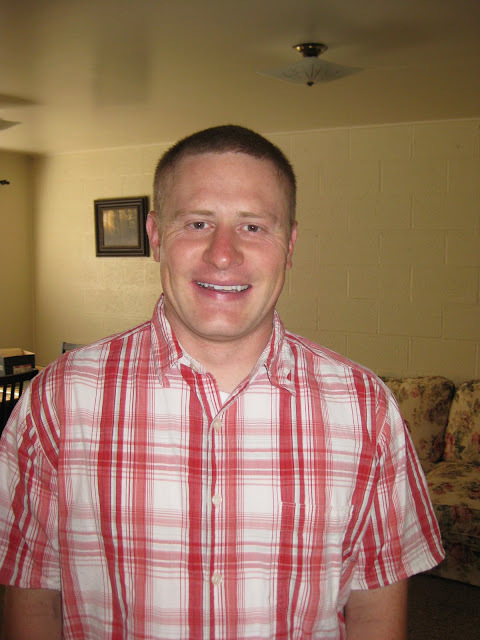 Anything is better than his hair in your last few blogs. P.S. Don't get me started on ramekins. They are Paul's dish of choice. I like the haircut, but I'm sure it's a different story in real lifes and I do mean "s." Um, whoever gave that advice about Flakes needing their sleep, gave the best advice ever! Ben is smart to listen to it. Stay cool. I was the all wise in-law who informed Ben of the extra 4 hours of sleep that all Flakes need in order to function and not be terribly grouchy. You're welcome. Seems to me like you (Ashley) should learn how to cut hair if he's paying for a bad cut. It all grows out in 2 weeks anyway.